HJ: Have you ever noticed that you feel specific emotions in different parts of your body? A team of Finnish researchers has created an innovative visual map that shows how different ares of our body are stimulated by different emotions, adding further proof to the growing realization that there is a very real, direct link between the body and the mind. So much so that scientists are now able to measure the level of impact that provoked emotional responses have on specific areas of the body. These findings could have major implications for understanding and diagnosing disease states and also creating therapies and treatments to heal them. Furthermore, for individuals interested in exploring the connection between the mind and body, this incredibly detailed visualization will likely provide many insights into the complex relationship between the two. (Click for Larger Image) Image courtesy of Lauri Nummenmaa, Enrico Glerean, Riitta Hari, and Jari Hietanen. 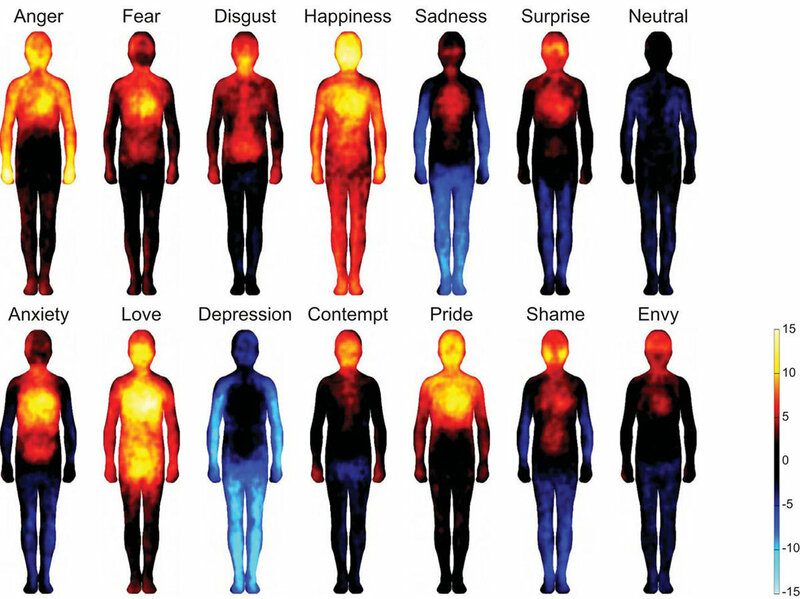 Finnish scientists have for the first time mapped areas of the body activated according to each emotion (happiness, sadness, anger, etc).This map was compiled following a study of 700 Finnish, Swedish and Taiwanese volunteers. This work was published December 31, 2013 in the journal Proceedings of The National Academy of Sciences under the title “Bodily maps of emotions”.